Scrum Renaissance | Does that answer your question? He he… I look good in that gettup. I think. Renaissance means that Scrum was dead before, but was it really? I don’t think Scrum and Kanban are incompatible. That’s the promise of extensibility in Scrum; now we’ll see if it delivers. While I can understand that teams and organizations adopt scrum incrementally, its important to understand that the promise of agile/scrum of an order of magnitude of improvement in output can only be achieved by being somewhat prescriptive. Without this scrum will end up being a disappointment. Also that biggest scrum but I have seen still holds. for all the scrum ritual and artifacts, without streamlining meetings, and without self organization/bottomup management, scrum simply becomes lip service. I really hope something does change, the general zealotry around Scum is really putting me off promoting something I know can work really well and offer an amazing opportunity to organisations. There needs to be humility and openness if Scum is to survive the backlash that lies ahead. Practice what you preach, collaborate and grow. Another nice article Cheryl. I almost feel bad now for telling David that Scrum was a religion…Almost. :-) It’s a great move forward and I am curious to where it will go from here. 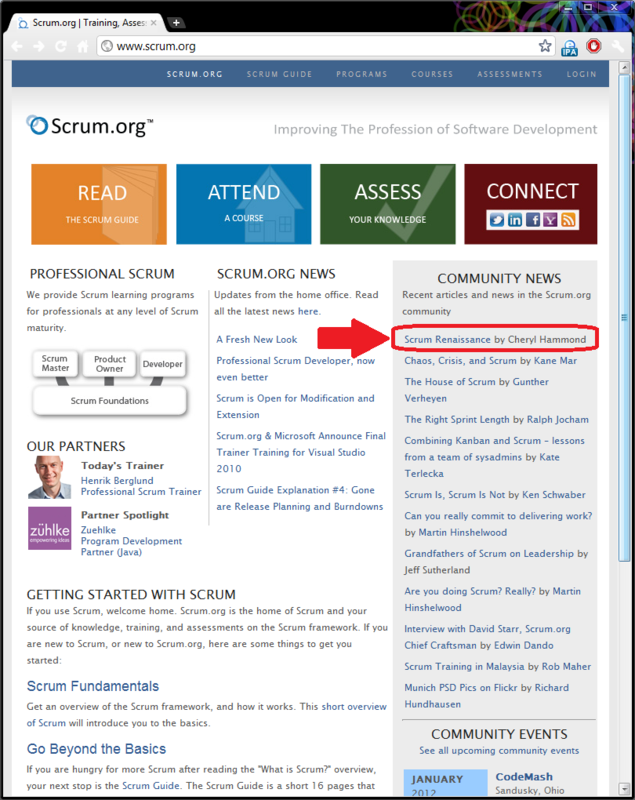 Pingback: Scrum for One | Does that answer your question?